Ledco's Industrial Series 38" thermal Roll Laminator in 220volt includes sturdy metal floor stand and now has 2 year warranty. 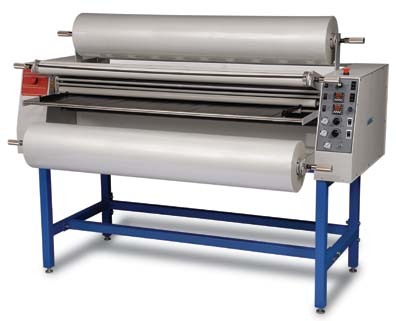 The 38" Ledco HD-38 Industrial grade lamination machine's durability, speed and capacity puts this heated roll laminator way ahead of slower digital output machines. Has intelligent microprocessor heat controllers that display both the set temperature and the actual temperature. Variable Speed: Max Mechanical Speed: 0 to 35 fpm. Max overall laminating thickess = 1/2"
Ships FREE via freight in the lower 48 states & includes mandantory crating !